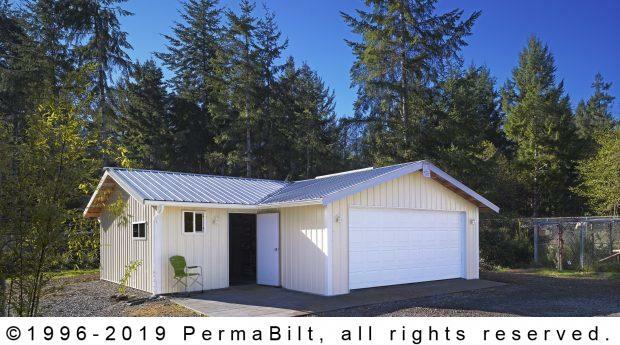 This L Shape steel garage was built on a client’s property in Shelton Washington. The steel garage was to be used for a cat sanctuary. It proved to be just what the doctor ordered as our client bought a total of 3 buildings from us. 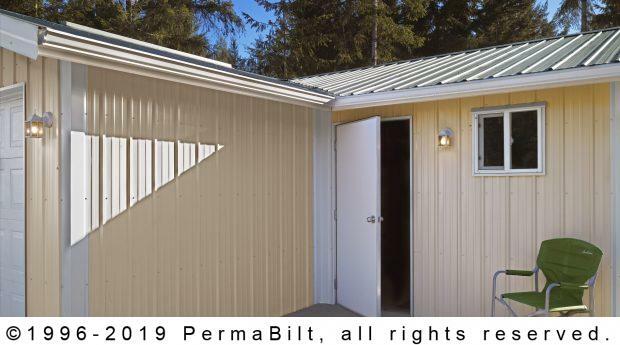 Once our customer communicated her building design to her PermaBilt® Building Representative, the next step was work on the elements included in sanctuary and office space. This included a 16’ x 7’ raised panel steel overhead door, a walk-in door with self-closing hinges and a stainless steel lockset, two standard windows to let in natural light and added ventilation. For continuous ventilation, she chose 10 foot long ridge vents. We permitted 3 buildings for the same property and put up 3 unique beautiful buildings for a very important cause. The end result was a L-shape sanctuary she could enjoy as well as give her peace of mind that the cats had a safe haven.